Last month, Kira Kazantsev was crowned Miss America in Atlantic City, New Jersey. I am so proud to be able to say I watched this girl compete at Miss New York last year, just make Top 10, then come back with a vengance and not only take the state crown but go all the way to Miss America. The shock is still there. Miss America is from New York, three times in a row. This is certainly why we always have a New York State of mind. Everything’s better in New York! Three Miss Americas in a row made history. But also, we have three Miss America homecomings in a row. This homecoming should make history as well, as one of the best. Following recent Miss America tradition, after a handful of appearances, performances, and hospital visits during her first month as Miss America, Kira would return to where it all began- The City of Lights. 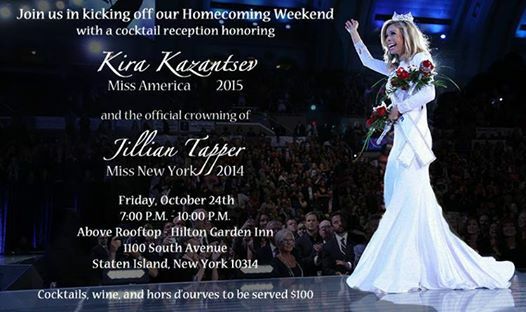 The first night of homecoming celebrations was a cocktail reception to welcome Kira home, but also the official crowning of Jillian Tapper as Miss New York 2014. State finalists, Oliva and Cady Ruth (Miss America’s OT and Miss NY’s OT), a handful of local Miss and Outstanding Teen titleholders and even some local contestants came together at the Above Rooftop on Staten Island to celebrate. Following an informal meet and greet in the lobby, guests followed the red carpet inside for cocktails. There was plenty of meeting new faces and catching up with familiar faces, with great food and drinks. Practically famous, photographers had a field day with all the visiting royalty. Guests were able to enjoy a video of the Miss New York 2014 pageant on a giant television in the background as they chit-chatted and enjoyed the company. Amanda Mason, emcee for the evening, welcomed guests and gave a sincere thanks for everyone coming- she knows first hand how it feels to be crowned a successor to Miss America. She gave the mic to Deb Cantoni, the Miss New York executive director, who pulled the concept of “three is a magic number” back from Miss New York. Of course there were the obvious- 3 Miss New Yorks, 3 Miss Americas, but also they only had 3 weeks to put together this fabulous homecoming! Additional speakers included Kira’s mom (who nearly made the group cry as she told Deb and Linda Carbo they were essentially Kira’s “adoptive moms”), a Miss America representative (who presented Miss New York, and the NY Local with plaques commemorating their successes), and finally Kira. Kira discussed her platform, but also the trials she has already faced since being crowned. She told us how she misses both of her homes here in New York, and back in California. She then dedicated the second part of her speech to her mom. She shared the memories about her mother clipping coupons every day for months to buy carrots and chicken, and how her father would purchase a hot dog from the YMCA for $1, twice each day. There wasn’t a dry eye in the venue, as she discussed overcoming adversity to be where she is today. 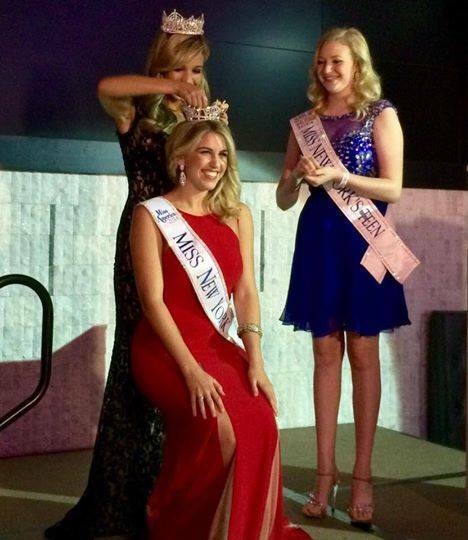 Finally, Jillian Tapper (Miss Southern Tier 2014, 3rd Runner Up at Miss New York) was crowned Miss New York 2014.